When the heat gets this intense, I try to make meals that don’t require much if any heat (even if the AC is on!). I’ve really enjoyed my spiral slicer, which makes instant “noodles” from raw zucchini. Now, don’t get me wrong — I have no problem with pasta, but in the summer heat, zucchini noodles just feel lighter. And they’re ready pretty much instantly, with a few cranks of the lever, and no heat needed. If you don’t have a spiral slicer, you can use your favorite noodles — rice noodles, bean-thread noodles, soba, or linguini —this works with all of them. If the peanut butter is soft, you can just combine the ingredients for the sauce in a bowl and whisk together. If it’s somewhat solid, combine with the remaining sauce ingredients in a food processor and process until smooth. Spiralize zucchini with the fine or medium blade, or shave with a vegetable peeler to make long “linguini.” Transfer the zucchini noodles to a serving bowl. Cut the strands here and there with kitchen shears, as they will be very long! Add the broccoli, red pepper, and optional scallions. Pour about half of the sauce over the noodle mixture and toss together. Then add more sauce as needed to moisten everything, but don’t overdo it, as you don’t want to drench the dish. You can save the remaining sauce for another day, or pass it around for anyone who wants a bit more on their portion. Let stand for a few minutes before serving. Try some other raw veggie “noodle” dishes. See VegKitchen’s review of the World Cuisine Spiral Slicer. I am a sucker for any Asian dish with these kinds of contrasting flavors, textures, and colors. 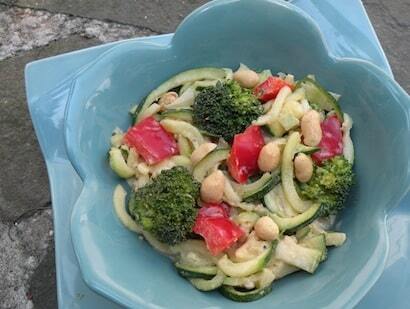 And I love the idea of using zucchini in place of noodles, as I try to limit my intake: a little too heavy for me. Thank you! So where can I find this elusive spiral slicer? I haven’t heard of it, but now I simply MUST have one! I’m an idiot. I just saw your review of the spiral slicer. Sorry to bother you!